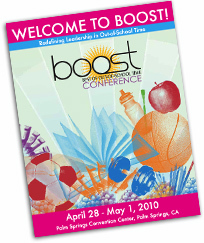 Please click on the 2010 Conference Brochure and download it to see what was offered at the 2010 BOOST Conference in Palm Springs, CA! After School University – Youth Development Begins With You! Inclusion After School and Parents: Teaming for all Kids! Positive Discipline & Classroom Systems That Work! Reading Enrichment with the Awesome Power of Reader’s Theater Will Help Your Student’s Reading Fluency and Confidence Soar! 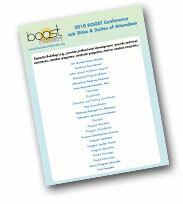 Understanding Poverty in the U.S.
Work Smarter – Not Harder: Making Your Afternoons R.O.C.K. !